Use these tips and ideas on how to save money during home renovations from people who are renovating a fixer upper by themselves. Lots of practical advice! This is a sponsored post written by me on behalf of BB&T. All opinions are 100% mine. Over the past few years, we’ve fixed up two old houses. Our first house needed cosmetic work, and our current house needed a LOT more. We’ve done this work on small budgets (without having any prior carpentry/building experience). We have learned a LOT between these two houses – and I’m here to tell you about some tricks you may not know about how to save money during home renovations. Get (free) estimates. Even if you plan on doing most of the work yourself – get someone to come out and give you an estimate for a certain job. We were surprised by some of our estimates we received. Sometimes, a job that would have taken us a few days would only take a contractor a few hours, and it was worth it to pay him to do the work because of all of the time saved. It doesn’t hurt to ask! And if your estimate is high, then you’ll feel better about all of the money you’re saving by doing it yourself. Get your estimates broken down. For example – we hired an electrician for our house. We asked him to give us a price for 3 can lights in the ceiling, 3 pendants, and plugs in the island. We also had him make a list of “add-ons”. He made separate notes of how much he would charge to move a current hardwired light over a few feet, or add an additional canned light, or add in a plug to a wall that didn’t have any electrical outlets. This way, we could sit down with our budget and figure out which add-ons were worth it and which ones would fit in our budget. As always – get multiple estimates. We had three contractors out before we found “our guy”. If we would have stopped at two, we would have paid almost 20% more! Get a contractor that will work with you. Once you find a good contractor or handy man, don’t let him go! Sit down and explain your vision and budget concerns. If you have a good fit, then you’ll be able to work together on a project. 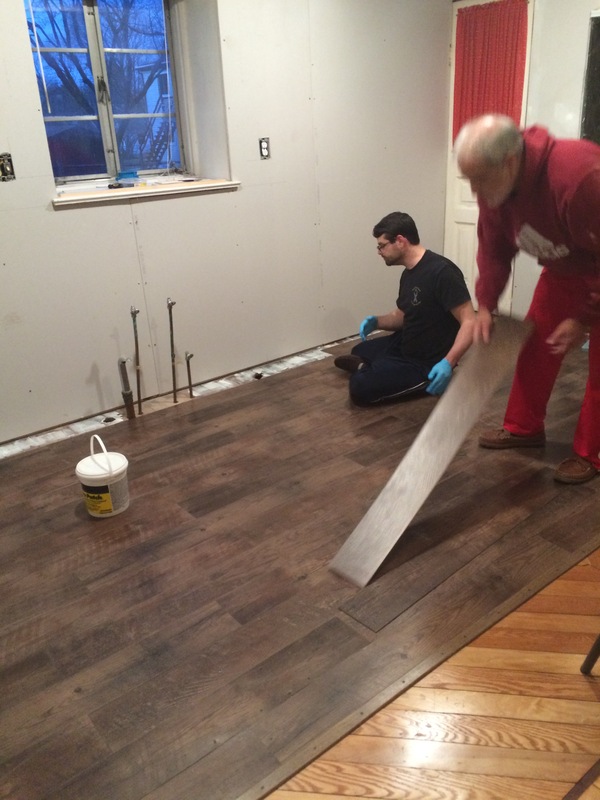 For example – we did the drywall on the biggest wall in our kitchen because it was going to be covered up with tile and shiplap. We’re not skilled at drywall installation, but it doesn’t matter when it’s covered up like that. We had our handy man install it in the visible areas in our kitchen, which was able to save us money. Another example – we installed our wood ceiling and crown molding in our hallway, but there were two cuts that were really tricky and we couldn’t figure them out. Our handy man was able to come over and just charge us for figuring out those two cuts, instead of installing all of the crown molding. There is so much free information out there! You may feel intimidated by certain projects, but seeing bloggers and other “real people” tackle these same projects is really such a valuable tool. My husband is a teacher at a seminary and had zero construction experience before we worked on our houses. My dad has also helped a lot, and he’s a doctor with no prior construction experience. They learned a lot through researching every job before we attempted it, and trial and error. It takes a lot longer than it would if a professional was doing it, but the money saved is absolutely worth it. Make sure you’re not spending money on things that don’t truly need to be fixed. We have plaster all throughout our house, and some people couldn’t believe that we were keeping it up. 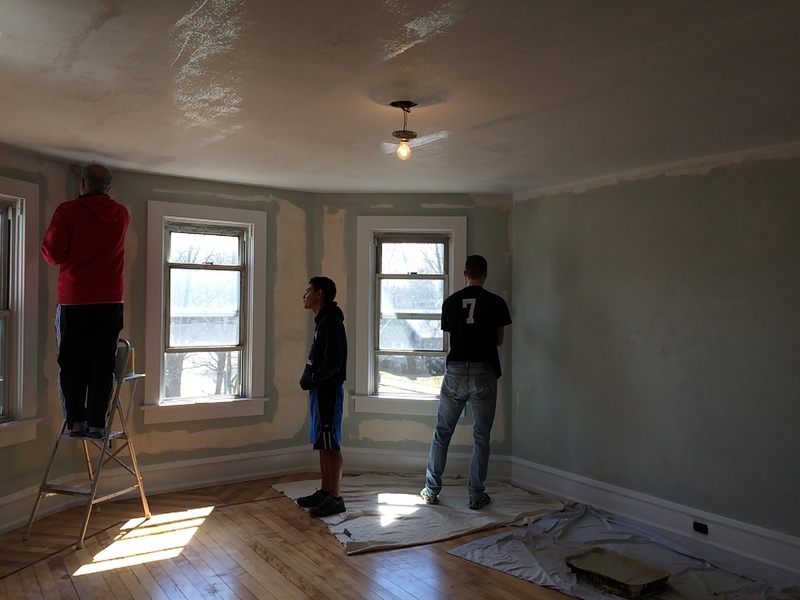 It needed repairing, but we were able to do that on our own for a MUCH smaller price tag than if we would have ripped out all of the plaster and replaced with drywall. DIY projects take time – and I’m one of the most impatient people out there. But you’ll pay a heavy price tag to have someone come out and do the work quickly for you. If your end game is to save money, you’re going to have to be patient and enjoy the journey of learning how to do the work yourself. It doesn’t come without frustrations, but it does come with a huge amount of satisfaction and pride! It’s easy to spend money without truly realizing where it all went. It’s a terrible feeling to find that your budget is depleting and you’re not truly sure where all of the money went! Consider using a super helpful service like U by BB&T. I didn’t know things like this existed when I was renovating, but I’m planning on using it when we make over our bathroom next year. With U, you can track your spending with charts and graphs (that are made for real people). You can actually store your receipts online – either by uploading pictures of them or having merchants send a copy to your dashboard. Learn more about U by clicking here – I was really excited to learn about this helpful platform so I could show it to you guys! If you’re looking to add character to your home – I have my BEST tips in this FREE ebook for you! Click here to access! 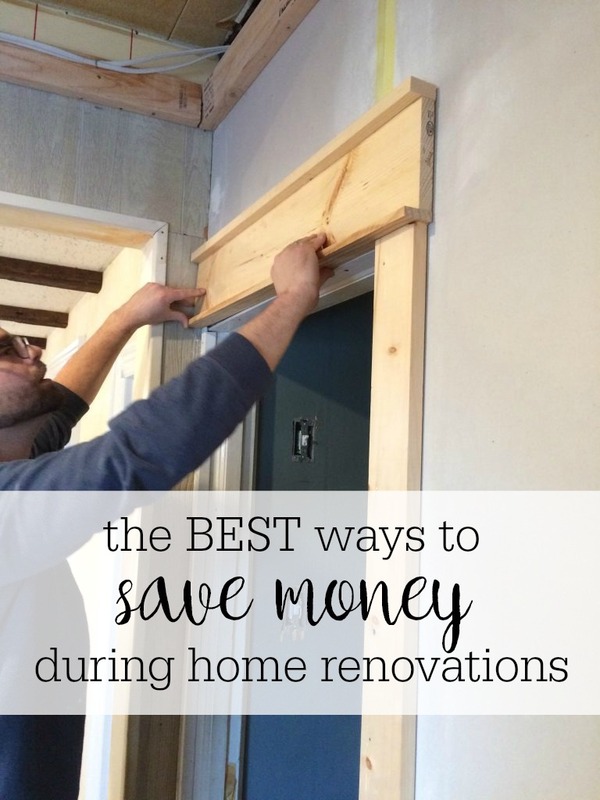 Please share these tips for how to save money during home renovations by pinning it here! Thank you for your helpful advice! Good luck! We’re getting ready to get into this, so this is good information to know. Plus, BB&T is actually my bank and I didn’t know they had those services! Sorry, Mark! I’m guessing it’s not…wish I could help! I just came across your blog and I love it! You have some awesome posts. I’m a new-ish blogger and one of my areas of focus is home decor and DIY’s. My blog is centered around thrifting and bargain shopping so I love these tips you gave! I also am getting some great inspiration from your blog so thank you! My aunt recently mentioned to me her desire to renovate her kitchen, but has been struggling to find room in her budget to complete every part of the project that she wants to. It really helped when you mentioned how important utilizing free resources can be in saving money, seeing as there is so much free information on YouTube and other DIY blogs. Thank you for the tips regarding home rennovation! Thanks for this advice for getting home renovations. I appreciate that you mentioned to get the estimates broken down to figure out what the add-ons are. This also seems important to really understand what exactly you will be paying for. I can identify completely with the need/want/make do compromises. My ex worked with our contractor full time to reduce our costs and we both did a lot of grunt work during the gutting/building phase. I lived with shower curtains in my master bath for literally years because I couldn’t make a couple of decisions about other things. I always intended to have a glass wall – which I do now – and it was worth the wait, but those clear plastic shower curtains worked just fine and weren’t completely ugly in the meantime. I’m now at the 20 years in point (how did that happen?) and am starting make some changes from my original choices (updating some stuff in the kitchen and the like) but I’m happy to say the things I wish I would have done differently is still surprisingly short. I just noticed your pin because of the woodwork trim and I wonder if you have any specific tips on saving money doing that type of Craftsman trim. We’re building a new Craftsman house ourselves and are getting close to the part where we do the trim and since we’re not borrowing any money, we need to save as much as possible. Any tips you have would be much appreciated!